First of all, I want to thank God for the journey mercies I experienced during the trip. It was a good trip and a learning experience for me. I have taken many trips to Uganda, but this time I went with more of a mind set to minister with the gospel. It was a learning experience because I saw the effort, love and creativity it takes to reach people with the gospel. The language barrier was hard, the interactions were not always what I had hoped, but I am encouraged that God still worked! 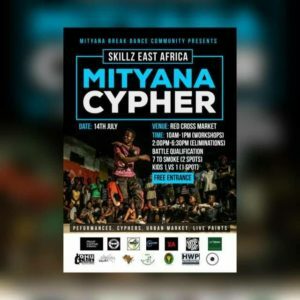 A friend of mine named Rique asked me to come judge at an event that he organizes called Skills East Africa Cypher. He uses the art form of breaking to bring about positive change in society. There are event qualifiers around Uganda (eastern, central and western), building to the finals in Decemeber. I was asked to judge at one of the western Ugandan qualifiers at a place called Mityana (70km from the capital, Kampala city) taking place on the 14th of July. My trip began on Thursday, the 12th of July at 7pm, when I boarded a bus to Kampala. On the way the bus had some technical issues that could have possibly resulted in an accident but fortunately it didn’t. We had to wait for two hours for another bus to be brought and we continued on our journey. I arrived in Kampala the next day at around 12:30pm and went straight a friend’s house who was hosting me. I took a nap then later on went to this hip-hop event for rappers. The next day at around 6:30am, I planned to meet with the team organizing the jam and we left for Mityana at around 8am and arrived at around 10am. Upon arrival, we had a short prayer session then went for breakfast to discuss the plan for the day. The meal was filling! Afterwards we went back to the venue, set up the sound and posters, and began the day. We started off with some warm-up sessions and later on went to workshops. There were three people, me included, who held workshops for popping, breaking and new style. My workshop was centered mainly on using space while dancing and creative change of direction. The response was positive. I later on went on to do a talk and this was a little challenging because of language barrier. This was the first challenge that I faced. I gave a talk on aligning your purpose with talent. After my talk, one of the locals tried to explain in summary the content and importance of my talk. There were showcases for beatboxing, dance and other elements of hip-hop. During this time, one of the local council chairmen of the community showed up and to my surprise, he was once a breaker. He did a showcase in his formal dressing which was quite on point. He gave a short speech and left to change into dancing clothes and came back. We then did an all style kids battle and ended up getting two winners who will represent at the finals in December. I was judging alongside bboy Bullet and bboy Shaban from Kampala. Afterwards we did the main battle of the day which was a seven to smoke battle (Kind of like King of the Hill. The first to seven wins is the winner). This went for 35 minutes and bboy Kansenene won. Kansenene in Ugandan means grasshopper, a rather interesting name for a bboy, but he was good. After that we did a judges showcase for about 5 rounds which was a lot of fun. We also did an all versus all battle for the visitors vs the Mityana team. In my opinion, we won! This was the final battle of the day. The event ended at around 7pm when we made our way back to Kampala. I traveled back to Kenya on the 16 the of July and reached safely on the 17th the next day. This trip was like an eye opener for me especially when it came to trying to minister to people as far as language barrier is concerned and just trying to get the patience to do so. I also learned how important it is to prepare well in advance for possible challenges ahead when going to minister, especially to the unique group of people who are part of the hip-hop community. I’m praying that whatever I shared would’ve at least impacted one or two people in Mityana and I am looking forward to more opportunities to serve God by reaching out to the hip-hop community. Finally, I just want to express my utmost gratitude to the people who contributed to make this trip a possibility for me. I appreciate your contribution and efforts to ensure that the hip-hop community is reached and impacted with the light of Christ. May God bless you and enrich you in all your ways…Amen.